It was a gorgeous summer day in Port Angeles, Washington. The golden grass glowed under the warmth of the sun, as Yela and Zane prepared for their magical wedding day. 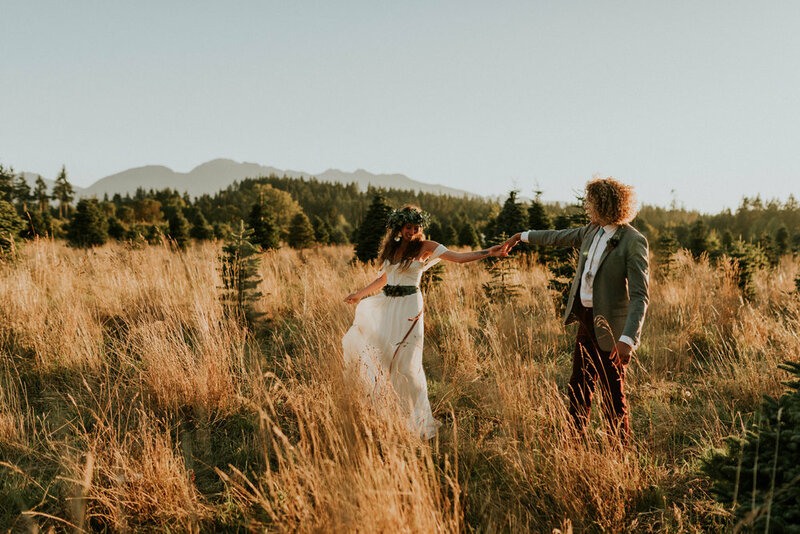 They chose a quaint little Airbnb property to say their vows to each other, that sat on the edge of the water between the Haro Straight and Straight of Juan de Fuca. Zane's sister (Fire and Blooms) created all the floral designs, from Yela's unique flower belt, her leaf crown, and the AMAZING bouquets of flowers. From the moment I arrived at the home, I could feel the emotion being expressed in so many different ways. Their friends surrounded them, celebrating in their love and reminiscing over all the memories they made together. It's an incredible thing to be able to be invited into someone's wedding space, to capture all the intimate moments, knowing that they were built on many many years of love, devotion and care for each other. Tears were shed over the exchanging of love notes and kind words before walking down the aisle. Zane waited anxiously for Yela to appear and as soon as he saw her, he let his emotions take over. It was beautiful to see the love they have for each other and how openly the expressed that love. After final I do's we made our way closer to the water, taking in the moment to celebrate this incredible commitment! Yela and Zane danced under the forest trees, had big laughs with their friends, and gathered with all their guests. Before sunset we all snuck away to get one last look at the golden sun, soaking in all it goodness as the Olympic Mountains stood tall in the background. When we got back to the reception, everyone was ready to party and dance the night away! Wedding Tip: ALWAYS have string lights! I am so thankful for this incredible experience and to second for Kathryn over at The Moody Romantic! I cannot say enough about her incredible talent and her big heart! Kerlyn is an intimate wedding photographer, using natural light to create emotive imagery to tell your unique love story! Kerlyn serves the Coastal Bend, Texas, Oregon, and beyond. For more information please contact or email me at info@kerlynvangelder.com!